Artemis the show – aerial circus, environmental issues and mythology combined! What is Artemis the show about and what kind of performance will it be? Artemis is a piece about our relationship with the natural world and currently that is a relationship that holds a great deal of grief and pain, so it’s attempting to navigate that through the medium of art and performance, as close to its raw core as possible. 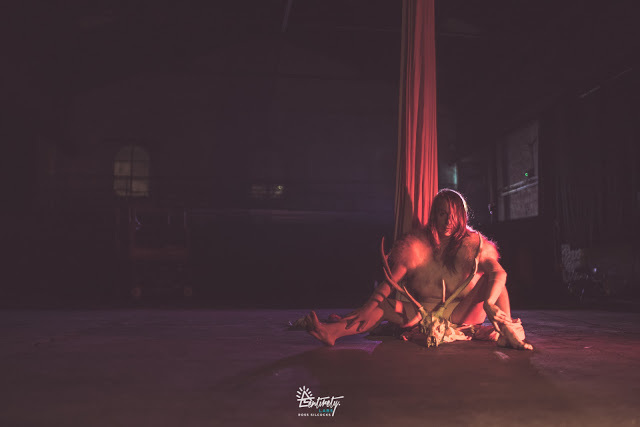 The show incorporates various performance skills from aerial circus to physical theatre to butoh, as a cross form collaboration that explores mythology, ritual and the environment. It’s set against a massive industrial warehouse which serves as the perfect modern space to explore in, not only this but the space is part of Bristol’s biggest nightclub venue, a purposeful contrast to the thematic content that speaks to us about nature. The piece is based on the goddess Artemis from Greek mythology and what she represents as the deity of the hunt, the wilderness and the moon, amongst many other things. But the story has evolved into something much more abstract than what this greek myth offers. In a style similar to Neil Gaiman’s American Gods, it sees her awake in the future when humanity has abandoned it’s relationship with the divine. It sees her flicker awake to discover the world as it could be and sees her dance to the point of resolution, whether to abandon or guide us. Artemis Trailer from Alana Bloom on Vimeo. I originally decided to make Artemis during my fifth and final year of performance training, as a way to cultivate my own work, but since then it has evolved into a way to engage through art. In short it has been a journey of discovering activism through creativity and performance, using art as a tool to present other way’s of approaching the themes we are facing in our society. It then became less about a decision, and more about crafting my tools as an artist, to dive into an expansive sea of issue’s that are integral to humanities evolvement. My research and development took much dreamtime and exploration over the past two years and was continuously present in the forefront of my thoughts until the point where I simply had to turn dreamtime into activity. Through the countless support and guidance of others, it has been possible to depart upon the journey of bringing that dreamtime into the land of the living. What environmental message are you raising? There is something to be said about holding the cooperation’s, businesses and governments accountable to what is happening to our planet, which is an idea that need’s be grabbed by the horns and thrown into the limelight. Yet we have the ability as individuals and communities to alter the ways in which we have been living and lead by example – perhaps this is through nurturing communities with emphasis on environmentalism, perhaps it is being radical in your own actions towards consumption, perhaps the example is to meet each human, animal and plant with compassion, perhaps it is to actively shout LOUD about those who should be held accountable. I do not have the answers to these questions, I hope to provoke and engage people with them so that they might mobilize their own answers into action. When and where will the show be taking place? The show will be taking place on the 4th and 5th of May at Motion, Bristol. This entry was tagged circus, environment, performance. Bookmark the permalink.